Each of the ten Canadian RIMS chapters elect a board member to be their representative to the RCC. The chairs of the RCC's three subcommittees, the National Education Committee (NEC), the National Conference Committee (NCC) and the Communications and External Affairs Committee (CEA) also attend RCC meetings. The Puffin Report is a short summary of the RIMS Canada Council meetings which are held twice a year. Now renamed the RCC update (see above links for these updates). Want to see all the historical Puffin Reports? 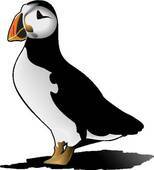 Just click on the puffin picture below.